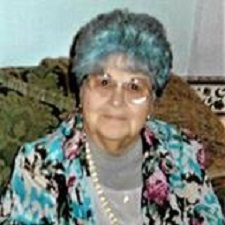 Della M. Davis, age 95, of Mena, Arkansas passed away peacefully on Friday, January 18, 2019, in Mena Regional Health System. She was born February 5, 1923 in Foose, Missouri to the late Zenith Patten and the late Susie Isabell Perdue Patten. The Pattens moved to Mena in 1928 and Della attended school at the Ransom School. She then lived out the rest of her life in Mena. She was a nurse at Polk County Memorial Hospital for many years. She was also employed at Renova Shirt Factory as a supervisor for several years. Her favorite pastime was vegetable and flower gardening. She also enjoyed writing poems, cross stitch, needle point work, quilting and canning. Her number one priority in life was caring for her family and putting others’ welfare in the forefront. She is survived by one daughter Joan Oats Purifoy and husband Marshall, two sons Donald Joe Davis, Jim “Jimbo” Davis and wife Linda, granddaughter Kalyse Greener and husband Steve, step-granddaughter Gemma Humphrey and husband Mike, grandson Patrick Purifoy and wife Kim, great granddaughter, Keeley Purifoy, step-grandson Ethan Nathe, step great-granddaughter Hadley Titsworth, great-grandsons Pierce Purifoy and Braden Donaldson, step great-grandson Gavin Humphrey, nephews Ernal Cunningham, Jeff Cunningham, Vester Parks, great-nephew Chris Head, great-nieces Melissa Tedford and Kelly Mos. Adopted family members were Dave Mitchell and Shelton Bohlman. Elizabeth “Pete” Hensley was a lifetime friend to Della and the family. She had a host of other friends including Lydia and other special nurses at Peachtree Assisted Living. Funeral service will be Wednesday, January 23, 2019 at 2:00 p.m. at the Beasley-Wood Chapel with Brother Ronnie Wagner officiating. Interment will follow in the White Oak Cemetery under the direction of the Beasley-Wood Funeral Home. Visitation will be Wednesday, January 23, 2019 at 1:00 p.m.
Pallbearers are Gary Ryan, Jeff Cunningham, Dewayne Lewis, Bobby Copelin, Patrick Purifoy, Braden Donaldson and Terry Plunkett.